The little herring is one of the most important fish on the East Coast, and federal fishing managers on Tuesday will consider a host of potentially major changes to the industry that harvests the species. Atlantic herring is a small, schooling fish that is the target of an industry that collects more than 100 million pounds of catch every year. The fish is also the subject of concern from environmentalists and fishery managers, as the National Oceanic and Atmospheric Administration has said a recent assessment of the herring stock shows a decline. The regulatory New England Fishery Management Council is set to vote on the future of the herring fishery Tuesday. The council is considering setting new long-term rules about how much of the fish can be harvested, as well as approving new standards designed to minimize herring fishing's impact on the environment and other marine species. 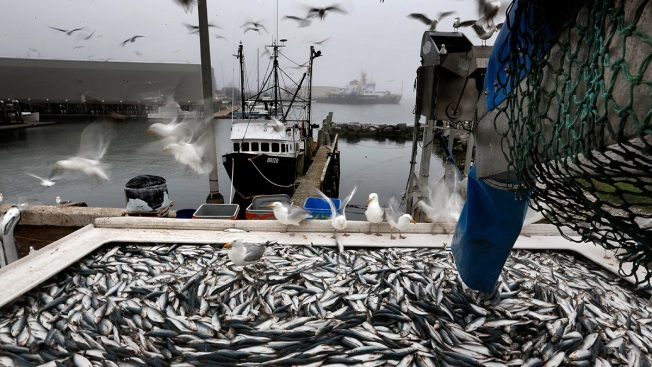 Debate over the proposed changes has prompted a clash between herring fishermen, harvesters of other species, conservationists and stakeholders. The herring fishery wants to make sure it isn't unfairly penalized for the decline of the species, said Jeff Kaelin, who works in government relations for herring harvester Lund's Fisheries of Cape May, New Jersey. "We know we're going to take that cut," Kaelin said. "Environment plays a bigger part than the level of fishing pressure that has been allowed." Herring are important economically because they serve as key bait for the lobster and tuna industries. They're also used as food for human consumption. But perhaps most important, the fish is a critical part of the marine ecosystem because it serves as food for whales, seals and large fish. The most prudent move would be for regulators to scale back the fishery so the ocean food web is protected, said Zach Cockrum, Northeast director of Conservation Partnerships at the National Wildlife Federation. "Forage fish are so important to larger species and predators that we need to be doing more," he said. "It's time to get some rules into place."